A puzzle game that requires the Robotic Operating Buddy to play. As Professor Hector, jump on the command keys to make R.O.B. stack the colored discs and match the pattern shown on the screen. However, the mean Bugs will try and confuse R.O.B. by sending him incorrect commands. Alongside the Stack-Up game cartridge, R.O.B. comes with a Stack-Up set, consisting of five trays that need to be attached to R.O.B. 's base, a pair of grippers that are attached to R.O.B. 's arms and five colored discs. This moustachioed professor controls R.O.B. from his giant laboratory, pressing keys to direct the robot's movements and stack the coloured blocks. Player 1 plays as Professor Hector in the Direct, Memory and Bingo game modes. Player 2 controls Professor Vector in the 2 Player Bingo game as they work together to stack the blocks. If Hector and Vector land on the same key, the one who was standing on it will be knocked off the board. One of the Bugs that appears during the 1 Player Bingo game. It jumps from key to key, switching them on or off and undoing the Professor's work. If Hector collides with Flipper, Hector will be knocked off the board. One of the Bugs that appears during the 1 and 2 Player Bingo games. It floats around above the keys and will knock Professors Hector and Vector off the board if it collides with them. Once you have set up R.O.B. in front of the TV screen, choose "Test" and press SELECT to send a signal. This will ensure R.O.B. is working correctly and receiving signals from the screen, and return R.O.B. to his starting position. The object of this game is to move the colored blocks from the starting position on the left to the final position on the right in as few moves as possible and as fast as possible. Moves Professor Hector left, right, up and down on the keys. Confirms that the stack has been completed, tallies your score and moves you to the next round. Returns you to the menu. Before Round 1, ensure the colored blocks are stacked on Tray 3 (the center tray in front of R.O.B.) in the starting position: from top to bottom - red, white, blue, yellow, green. There are 6 command keys arranged on a 3x3 pad (the middle row is for moving Hector between the keys). The top row keys are: Left, Up, Right. The bottom row keys are: Open, Down, Close. Jump on the command keys and R.O.B. will perform that action. Using the command keys, restack the blocks from the starting configuration (shown on the left) to the final configuration (shown on the right) in as few moves as possible. The Bonus timer counts down as you play (approx. 1 second per point). The faster you clear the puzzle, the more Bonus points you receive. The Bonus timer does not go above 130. Press the START Button to confirm the stacking has been completed. Your score will be tallied and you will move on to the next round. The round counter goes up to 99. The rounds will continue after that point, but the counter does not go past 99. Each round is randomly generated. In the Memory game, you must program all of the commands required to direct R.O.B. to re-stack the blocks from starting to final positions before he begins. Moves Professor Hector on the command keys. The Professor can also jump on the grey area above and below the row of keys. When writing commands: Move the cursor to highlight the command that will be written on the next key Hector jumps on. B moves the cursor to the left and A moves the cursor to the right. On the Speed Selection screen: B will increase Hector's speed and A will decrease Hector's speed. When writing commands: Confirms you are finished and opens the Speed Selection screen. On the Speed Selection screen: Leave screen and begin playback. During playback: Confirm the blocks have been stacked and move on to the next round. Before Round 1, ensure the colored blocks are stacked on Tray 3 (the center tray in front of R.O.B.) in the starting configuration: from top to bottom - red, white, blue, yellow, green. A row of unmarked memory keys stretches off to the right. Use the A or B Buttons to move the cursor under one of the commands. Jump on a memory key to write that commans to that key. Up to 100 keys can be written. Write the commands onto the memory keys in the order you think will restack the blocks from the starting configuration (on the left) to the final configuration (on the right) using as few commands as possible. When you are done, press START to open the Speed Selection screen. Press START on this screen to play back the commands to R.O.B. (note: adjust the speed to prevent Hector confusing R.O.B. 's movements). The Bonus timer counts down as you write the commands (approx. 1 second per point). The faster you clear the puzzle, the more Bonus points you receive. In Bingo, you are presented with a 5x5 grid of keys. Hector has to jump on across an entire row or column of keys in order to execute a command for R.O.B. with the aim to stack all of the blocks from the starting position to the finish position. However, the Bugs Flipper and Spike also appear to get in the way. Moves Hector around on the grid. Hector can stand and move around on the black area outside of the grid. Pauses the game and scrolls the screen down to display the stacking instructions, score and number of moves. When paused, START will confirm the blocks are in the right positions, tally your score and finish the round. Stack the 5 blocks in the starting position on Tray 3 in any order (the color of the blocks does not matter in this game mode). Work out the commands you need to enter in order to stack the blocks. Hector has to jump on a complete row or column of five keys to send that command to R.O.B. The command that will be sent is labelled to the sides of each row and column (the center row and column will not send a command). When Hector jumps on a key it will move to the "on" position and become dark. If he jumps on that key again it will move to the "off" position and become light again. The bug Spike will float around and get in your way. The bug Flipper will jump around on the keys and reverse them from "on" to "off" and vice versa. If Hector collides with a bug, he will fall off the screen and return to the side. If a row and column are completed at the same time, no command will be sent to R.O.B. Make one of the commands incomplete to send the remaining command. Restack the blocks as fast as possible and in as few moves as possible to collect Bonus points. When all the blocks have been stacked in the finish position, press the A or B Button to pause, then press the START Button to tally your score and move on to the next round. A 2 player game mode based on the Bingo game. Professor Hector (Player 1) and Professor Vector (Player 2) compete to see who can get the most blocks onto their trays in 5 minutes. The controls are the same as Bingo (1P). Stack the five blocks in the starting position: 3 blocks on tray 3 and 1 block on trays 2 and 4. As in 1 Player Bingo, the color does not matter. Professor Hector (Player 1) has to move blocks to trays 1 and 2; Professor Vector (Player 2) has to move blocks to trays 4 and 5. 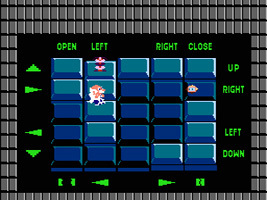 Each player has to complete rows or columns of keys to send commands to R.O.B. The bug Spike will appear, but not Flipper. If a Professor collides with Spike he will fly off the screen, and when he returns he will be flashing. The flashing lasts for around 20 seconds, during which time the Professor will be safe from Spike and the other Professor, but will move at half-speed. If the Professors land on the same key, whoever was standing on the key at the time will fly off the screen and start to flash. The time limit is 5 minutes. The scoring system is the same for Direct, Memory and Bingo game modes. At the end of each round, press START (or in Bingo, pause then START) to clear the round. BONUS: A timer that counts down as you play. The faster you move the blocks, the more Bonus points you receive.